Reservations are only guaranteed with a deposit and a confirmation email. Guaranteed reservations must be canceled 72 hours in advance to receive a full refund on the deposit. You must receive a cancellation number directly from the Park Motel and keep record of the cancellation. You must be at least 21 years of age to reserve and/or check into a room. All guests under 21 must be accompanied by a parent or guardian. Government issued identification may be required at check-in for all occupants. All rooms are non-smoking. Sorry, but our motel is not pet-friendly. You will be charged additional fees for smoking in your room and for any damages to the room. 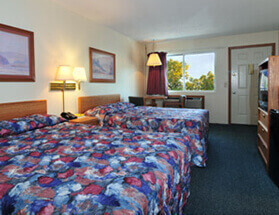 Our two room suites have two separate rooms. A queen bed in the bedroom quarters with your own TV. The living room quarters has two Queen beds, a flat screen TV, a refrigerator and a microwave. Sleeps 6 comfortably. Our deluxe rooms are spacious and are located by the outside pool. They have 2 Queen Beds, a futon, a refrigerator, and a microwave. Max occupancy is 6 people. Includes 4 wristbands to Wilderness Resort. Get up to 6 wristbands for additional fees. 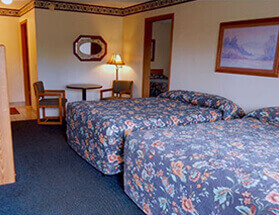 Each standard room includes 2 queen beds, a flat screen tv, a refrigerator, and a microwave. Up to 4 people can sleep comfortably. 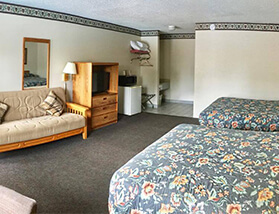 Two connecting standard rooms are available upon request. Each room includes 4 free wristbands to Wilderness Resort. Get up to 6 wristbands for additional fees.